BitTorrent has been around for so many years and it’s still widely being used today. You can find a lot of things including the latest movies to download on a popular BitTorrent tracker website such as “The Pirate Bay” which the authorities can’t seem to permanently shut down. Downloading files using BitTorrent requires a client software such as uTorrent, Vuze, Deluge, Tixati, and etc to do the job. Every BitTorrent client software has its own distinct advantages and one very useful feature that is not commonly found is the ability to “stream” which is to start the playback without waiting for the whole file to complete downloading. Just like viewing online videos in YouTube, you get to start watching right away and that saves you a lot of time. Actually streaming videos is supported in uTorrent Pro ($19.95 per year) and Vuze+ ($29.99 per year) but both require a valid annual subscription to use this feature. If you’d like to stream a video or movie file from torrent, here we have 10 different software that can do it for free. Not only does Hola offer a free VPN to allow access on geo-restricted website such as Pandora, it also comes with a unique media player that is able to stream a torrent and play the video directly from your web browser. After installing the Hola extension, simply move your mouse cursor to any magnet or .torrent link on a website and a small Hola box will appear. Clicking the Watch Now button will overlay a media player that automatically starts downloading the torrent for streaming. You can add subtitles to the movie by dragging and dropping the subtitle file or click the Upload button to browse for it. Hola can be installed in Chrome and Firefox as an extension but their download page automatically offers to download an installation package for the Windows operating system that runs Hola independently on a portable Firefox. You can cancel the download and click on the “Show all downloads” link to reveal the direct download links for Hola. ROX Player may look like just another media player that comes with built in codec to support playback of all common video file formats, but it stands out because it has the ability to stream a torrent through .torrent files or magnet links. It is possible to associate ROX Player with .torrent files and magnet links from the program configuration so that you can easily and quickly start streaming by clicking on the hyperlink from a BitTorrent tracker website. 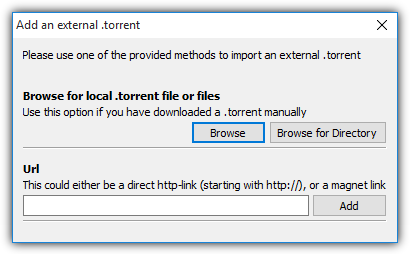 TorrentStreaming is an easy to use program that is created just for streaming torrents. All you need to do is either drag a .torrent file and drop it on the program’s interface, or alternatively you can paste the direct .torrent link or magnet link to the box located at the top right and click Stream. Tribler is a BitTorrent client application that focuses on anonymity downloading using a custom Tor-like network. Do take note that the anonymity feature is still in an experimental state which means that anonymous downloading is not guaranteed. If you only care about streaming torrents, simply click the “Cancel” button during installation when the program ask if you’d like to use the experimental anonymity feature. To stream a torrent, simply click on the plus icon located at top right, and you can either browse for the .torrent file or paste the magnet link. After adding the external torrent, go to Downloads, select the torrent that you’ve just added and click the Play button located at the top. You’ll be automatically transferred to the Videoplayer and the movie will start streaming. Tribler is available for Windows, Mac OS X and Linux. Fetchr is actually a paid online service that helps you download any files from BitTorrent and store it under your account which is only accessible by you. Technically speaking, Fetchr is not able to immediately stream movies from torrent to you because the file needs to be fully downloaded and stored in their server first. When Fetchr finishes downloading the requested torrent file to their server, then you can start streaming. Although it is a 2 step process, it shouldn’t take long for you to start streaming because Fetchr servers are extremely fast to grab the files from BitTorrent if they are well seeded and you can enjoy a more stable stream directly from Fetchr servers. Moreover, if the file has been previously requested by another Fetchr member, it will be instantly available for you to stream. Another advantage in using Fetchr is you no longer need a VPN to bypass your ISP blocking BitTorrent traffic or to avoid a warning letter by your ISP for illegally torrenting a movie. There are quite a number of other websites that offer similar service as Fetchr but Fetchr is the only one that is generous enough to offer a free 60 minutes trial. Although it is a very short trial duration, it is enough to stream an episode of a TV series, or very useful to preview the quality of the movie that you want to stream from a torrent. 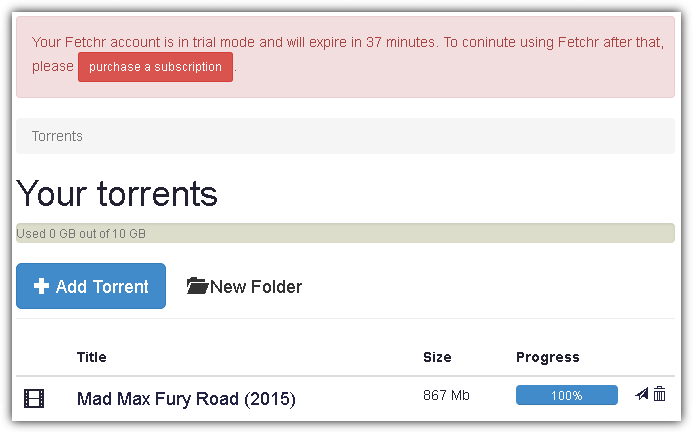 Torrent Stream is a simple to use extension for Google Chrome where you can stream movies from torrents. After installing the Torrent Stream extension, all you need to do is paste the magnet URL in the app or use a helper extension to automatically open a link with Torrent Stream through right click context menu. Torrent Stream will instantly start connecting to the peers once it detects a magnet URL being pasted to the box and attempt to stream when it has downloaded enough bits for the video. A nice feature found in Torrent Stream is the OpenSubtitles support to automatically find a subtitle that is in sync with the movie. 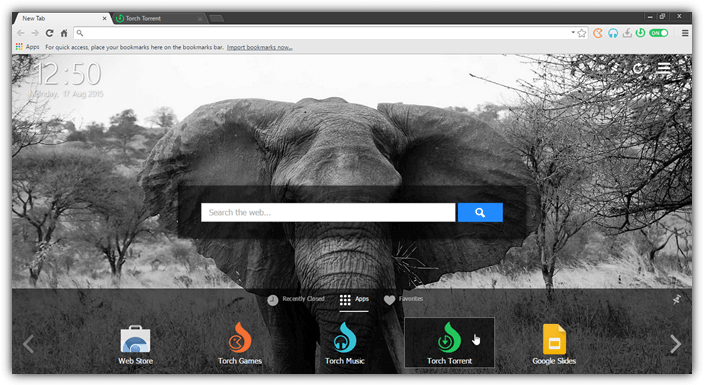 Torch Browser is a web browser based on Chromium that has features such as torrent downloading, streaming, media grabber, music player, games and download accelerator built-in to the program without the need to manually install any other third party extensions. Most people wouldn’t have problems using Torch Browser because of the familiar GUI that is very similar to Chrome. 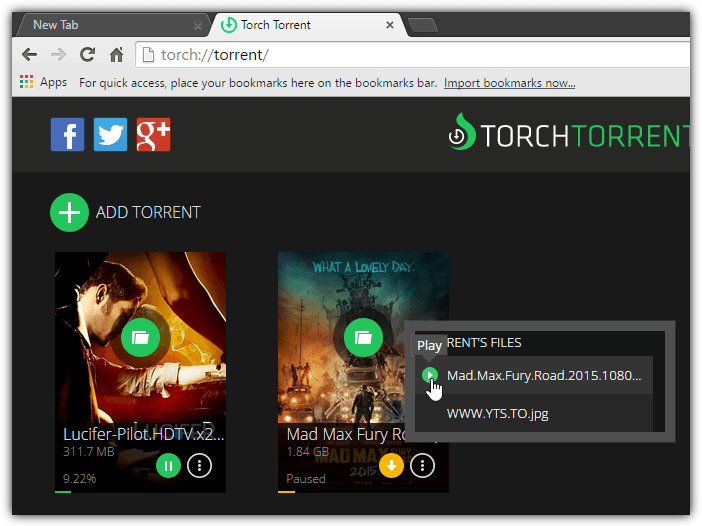 Downloading a torrent is as easy as clicking the Torch Torrent icon located at the bottom dock panel, click the add torrent icon, and either insert a magnet link or browse for a .torrent file. To stream a downloading torrent, you need to wait until a folder icon appears on the movie cover where clicking on it will show the torrent’s files. A video file can be streamed by clicking the play icon. Pay attention during installation because the Torch Browser setup installer prompts to install ad-ware so make sure you decline or uncheck the necessary checkboxes to avoid getting any unnecessary software in your computer. 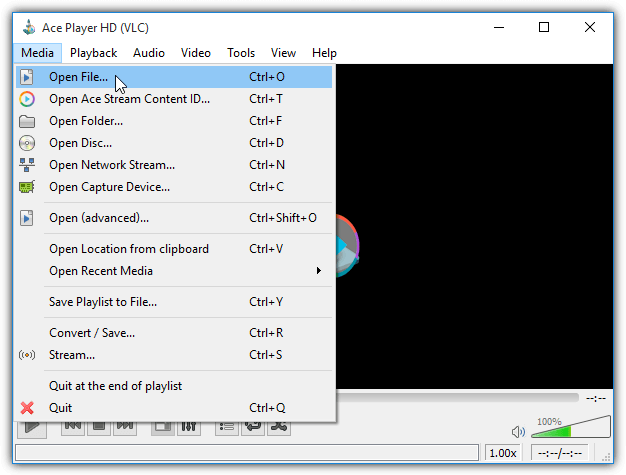 Ace Player HD is a media player that is modified from the popular VLC to support downloading and streaming video files via BitTorrent. It is part of Ace Stream that does much more such as live broadcasting than merely just streaming torrents. If streaming a torrent is the only feature that you want to use, then we’ll show you how to get the Ace Player HD out of the Ace Stream package. What you need to do is go to $_OUTDIR folder, copy everything from the $_OUTDIR folder and paste it to $2\player\ folder. You can now run Ace Player HD by double clicking on ace_player.exe. Ace Player HD can only load a .torrent file by clicking Media from the menu bar, select “Open File” and browse for the .torrent file. If you need to stream a torrent with a magnet link, a solution is to convert the magnet links to .torrent file at magnet2torrent.com. Zona is an alternative to Popcorn Time which allows anyone to easily stream movies, TV series/shows, Live TV, music, radio and even play games for free. Unlike the traditional method of visiting BitTorrent websites that are filled with advertisements to obtain the magnet URL or download the .torrent file, then load it to your BitTorrent client software, Zona made it so much easier by just running the program and choosing a movie to watch from the official nice looking movie covers. Not only can you watch movies using Zona, you can also stream torrents by adding a magnet link or choosing a downloaded .torrent file. Click on Downloads at the sidebar, then click “Add download item” button located at the bottom where you can either enter a magnet link or select the torrent file. Once the torrent starts downloading, you can start playing by double clicking on the torrent which will open a small preview window at the bottom left. You can open the player in a new window by clicking the icon and enlarge the screen. Zona is created in Java by Russians and there are still traces of Russian characters even if English is selected as the language for the program. While the original Popcorn Time has been discontinued, you can still find Popcorn Time being independently developed by 3 different groups which is popcorntime.io, popcorn-time.se and Isoplex. All of them are very similar except you can say that popcorn-time.se has noticeable differences such as offering Kebrum VPN for free and launches slightly faster but does not allow adding of external torrents or magnet links for streaming. Isoplex is maintained by Isohunt and is basically the exact same thing as popcorntime.io except being renamed. 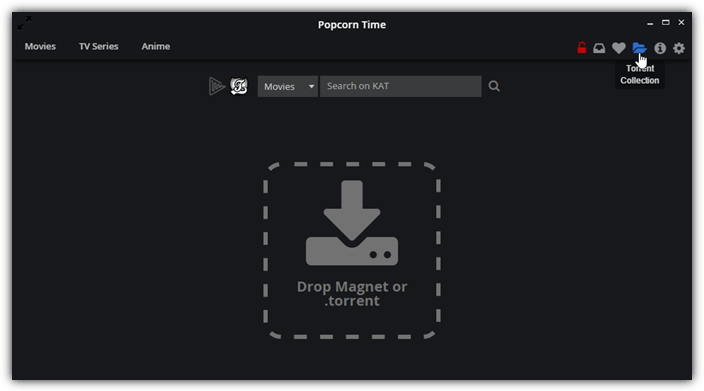 So if you’d like to stream an external torrent, we’d recommend Popcorn Time by popcorntime.io. 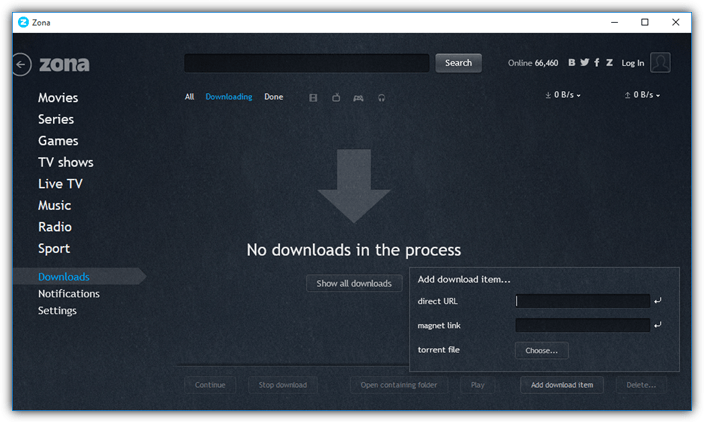 You will need to click at the Torrent Collection icon where you can drag a magnet link or browse for a .torrent file. Popcorn Time will download and start stream when it finished buffering. Take a look at miniget, you will not regret it. It offers a video search engine in the graphical interface, supports subtitles and audio languages if they are directly present in the torrent, and has a basic chromecast support. It tries to play the video as fast as possible. At the moment I only made a Windows version. I’m trying to port it to Linux and Mac. Thank you for the Info. I use streamdrive.net . They say that are still in beta but never the less work very nice. Stremio is awesome. 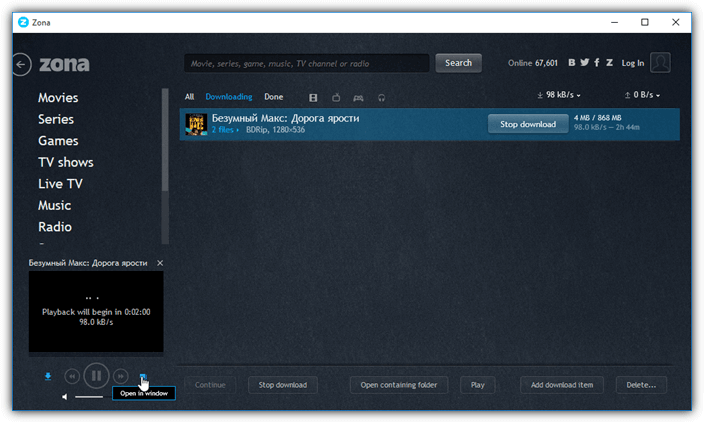 It is like the Netflix of torrents! Everything is so organised and well catalogued. Nice share Ray.Now it’s your time to find out some bugs ;). It very modern and it make me more easy for watching. I hope you will try to help us more. Good luck reymond.